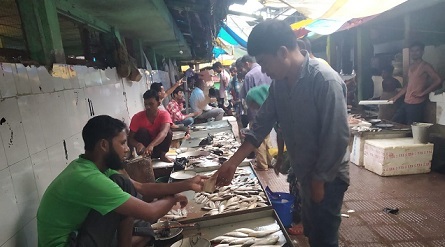 Diphu market in Karbi Anglong district has been hit by the ban on storage and sale of fish supplied from outside the State due to use of formalin to preserve the same. The designated officer (food safety) of Dima Hasao and Karbi Anglong, the office the Joint Director of Health Services, Cachar district, issued a notice on July 11, stating that all fish sellers as per Government notification (No FSC/17/2018/8 dated July 10, 2018), the storage, distribution or sale of fresh fish and crustaceans brought from outside the State has been prohibited in the districts of Dima Hasao and Karbi Anglong for a period of 10 days till corrective measures are taken from the date of issue of the notification. As per reports, the presence of formalin is suspected in the fish brought from Andhra Pradesh and other States. Due to this, the Government of Assamon Wednesdaylast banned import of fish from other States and sale of the same in Assam for a period of 10 days. The fish brought from outside have not arrived since July 2 and the fish from within Karbi Anglong and the neighbouring districts have become costlier. A wholesale fish dealer in Diphu market, Prasanta Timung, said he has stopped dealing in fish brought from outside the State. He said with the absence supplied fish, the rates of fish caught from local ponds and brought from neighbouring places like Nagaon, Doboka, Langka, Hojai and Lumding, which are auctioned in Diphu fish market, have gone higher. Bahu fish, which was normally retailed at Rs 400, has now gone up to Rs 500 per kg, while Rohu fish which was earlier sold at Rs 300 is now sold at Rs 400. The auction price of fish has also increased. Timung rued that the supply of local fish is not sufficient. A fish vendor, Jivan Sah, has not done much business since the ban on fish from outside the State. The Greater Diphu Bazar Committee in a press release said that it has put a ban on the business of fish brought from outside the State. It also requested the traders not to hike the prices of local fish on sale.